This beautiful little girl will be ready to leave us in mid January!! Chara is smack dab in the middle of their fuzzies but will get better and better looking from here on out as the fuzzies go away and her spotting get darker. Chara’s rosettes and spots will get much darker as she matures. (Lynx points start out white at birth) You can check our queen’s and king’s page to see examples of what Lynx Bengals look like as adults. 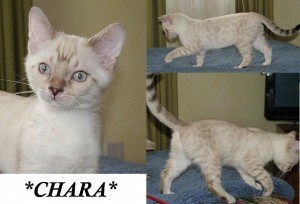 Please click on the links to see a short video of Chara in action or come and meet her for yourself! This entry was posted in Bengal Kitten Gallery, Gallery and tagged Bengal, Bengal kitten, bengal kittens, brown marble bengal kitten, marble bengal. Bookmark the permalink.